The Pound enjoyed some much-needed support leading up to the Bank of England chairman Mark Carney delivering a speech at the economic affairs commission in London. Speaking on growth, inflationary measure and the ongoing matter of Brexit. The speech which was hosted at the house of lords in London covered economic affairs. Carney buoyed sterling GBP by both endorsing Brexit’s progress and the more orderly manner Brexit was being handled. Plus providing an upbeat view of the UK’s future growth opportunities. The Bank of England anticipates that UK investment will pick up again next year as the uncertainty surrounding Brexit slowly subsides. Highlighting UK business, Carney stated that he thought that businesses were looking for certainty and once the scenario and outcome around Brexit became clearer UK businesses would be more willing to put their money to work. The third quarter of 2017 saw UK business investment touch 1.7% against a predicted slowdown of 2%. The office for national statistics GDP data also supports Carney’s claim and although 2017 UK GDP was the weakest since 2012, achieving just 1.8% growth, the final quarter was better than expected showing 0.5% growth. Whilst Carney may live to regret his arguably premature comments, the Bank of England chairman stated that he felt that the likelihood of the UK walking away without a trade deal was becoming more remote. Government forecasts were leaked earlier this week highlighting that the UK economy had lost roughly £10 Billion of growth per year since the referendum. The bank of England, therefore, will be keen to ensure the next rounds of talks which are due to be less fractious than those previously held. Carney uncharacteristically also commented on the form of economic data which should be used to gauge inflation. Proposing the government to abandon the UK retail price index (RPI) and consumer price index (CPI) as a way of gauging UK inflation. Essentially Carney chaired the idea of having a single main measurement for inflation, his suggestion was to replace the retail price index RPI and CPI with the office of national statistics barometer. CPIH which also comprises housing costs. Sterling has enjoyed significant gains in January with the pound to US dollar breaching 1.40 and touching 1.4302 just a week ago. Sterling GBP jumped following Carney’s speech and overview of the UK’s growth prospects for 2019. GBP- US Dollar currency pair moving from 1.4172 to 1.4249. Essentially unexpected growth and business demonstrate confidence in the economy. Were growth to transpire as Carney predicts, the Bank of England would be compelled to review the current interest rate levels. A higher interest rate which wouldn’t be implemented solely to tame unruly inflation would bode well for the Pound. Pound to Euro exchange rates also benefited from Carneys upbeat tone with the GBP/EUR exchange rate touching just short of 1.14 from 1.1372. A more significant move against the Euro proving impossible following the current appetite for the single currency. When could the next UK interest rate rise happen? Many experts remain at odds with when the UK’s next interest rate rise will take place. Despite arguably a more coherent dialogue between the UK and the EU Brexit still remains a huge risk and May tenure seems far from assured. In a recent FT economists survey 20% of those who completed the survey believed the UK wouldn’t raise interest rates this year. However, two-fifths believed that rates would rise 0.5%. Another key concern around the economy and key initiators for a UK interest rate rise remains UK inflation which hit a high of 3.1% far above Carney’s idea of 2%. 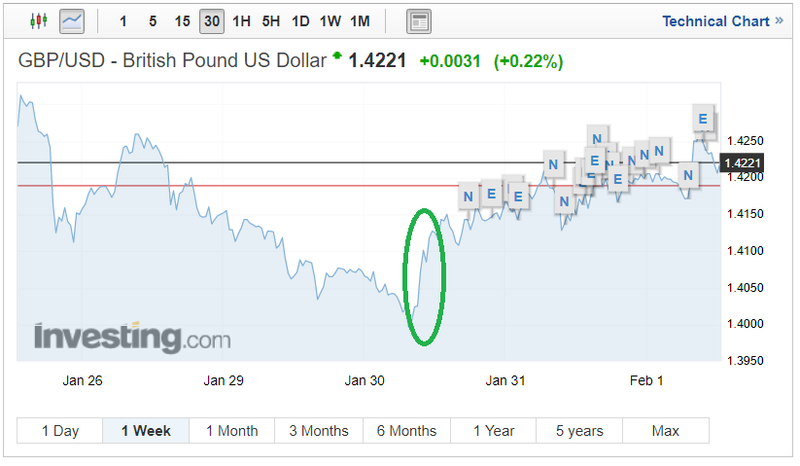 If Sterling GBP was to continue appreciating this would have assisted in their objective to calm inflation.